Address: 9700 Szombathely, Bartók Béla krt. 39. Hotel Claudius**** established by the Romans 2000 years ago awaits its guests in Szombathely. 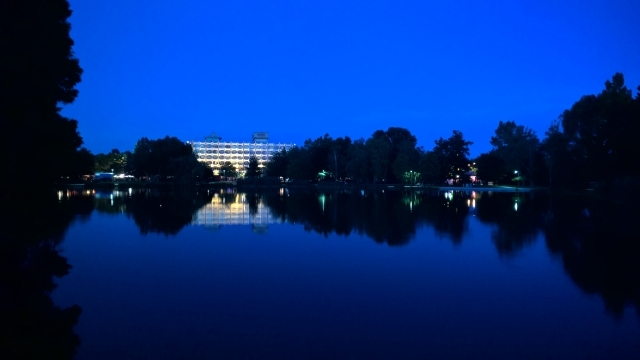 Our hotel is situated on the most wondeful greenbelt of the city with a great view of the Boating Lake. The building, renovated in 2004, is surrounded by a lot of entertainment facilities, such as the adventure bath, the indoor swimming pool or the children’s favourite, one of the biggest playground comlpexes of Central Europe, the so called „Adventure Park”. Tourists and businessmen visiting the „Queen of West” can admire the Cathedral and Main Square built in baroque style and located within walking distance of our hotel. Our air-conditioned and well-equipped conference hall – with a capacity of seating 200 people – and the 4 meeting rooms of different size offer an ideal place for organising both larger conferences, balls and weddings or smaller gatherings for friends and families. The unique menu card of our restaurant provides a great choice of traditional Hungarian dishes and other specialities to whet different appetities, accompanied by the best Hungarian wines, a broad variety of famous Hungarian „pálinkas” (fruit brandy) and complete with a highly professional staff. If you prefer vegeterian or dietary dishes, you don’t need to worry, because all individual wishes are fulfilled by our highly-appreciated chef provided he is informed of these wishes beforehand. We do hope that our clients will return from Hotel Claudius**** greatly satisfied with our hospitability and reliability and will enhance our good reputation. o The guests under the age of 18 do not have to pay the tourism tax. * We would like to let you know, that our EUR- and HUF-prices are fix rates. If you pay by credit card or in HUF, you must be aware of the fact, that in this case the current exchange rates are valid, consequently the invoice will be emitted according to that. * Under the age of 6 breakfast and accomodation are free in the same room with parents without extra bed. you can order half portion at half price: 1.475,- HUF/person/night. * You can bring your pet with yourself under the general conditions of pet keeping for the amount of 4.000,- HUF/night/pet. * The fee for one night entitles you to use the room from 2 pm on the day of arrival till 11 am on the day of departure. You are asked for give information about your leaving. If you miss to leave the room till 11 am we would invoice another night cost. Our hotel awaits guests in 97 rooms, all air-conditioned and equipped by phone, TV and minibar. Each room has balcony and a bathroom, which basic equipment contains bath, hair dryer and a cosmetic mirror. Wireless internet (WiFi) is available in the whole house. Thanks to its capacity – available for 200 person at he same time - our restaurant gives place to a lot of family pragrams, business programs and weddings during the year. Our restaurant is willing to make any occasion personal with international gastronomy within diet and vegetarian dishes, which are completed with the best Hungarian wines and the large scale of the famous Hungarian „pálinka”. Our hotel is the best place for organising conferences and business occasions in a peaceful atmosphere with an excellent staff and well-equipped technical supports. Our conference rooms are air-conditioned and wireless internet is available in each of them. GPS: LAT: 47°13'' 59.04" / LON: 16°36'' 12.56"